Today I have something of a gripe to get off my chest about Twitter’s use of ‘favourites’ today – a personal bugbear and a Facebook rip-off feature that I hope they will kill off in the near future. Twitter’s retweet concept was a brilliant one. Create a platform where sharing can instantly become viral and has the capacity to reach audiences beyond your immediate connection – this was revolutionary and completely blew the competition out of the water from a business perspective. With over 400 million tweets sent every day worldwide, it is easy for a single message to become lost amongst all the rest. Yet, with retweets, the chances of the right audience seeing that message were greatly increased with each share. 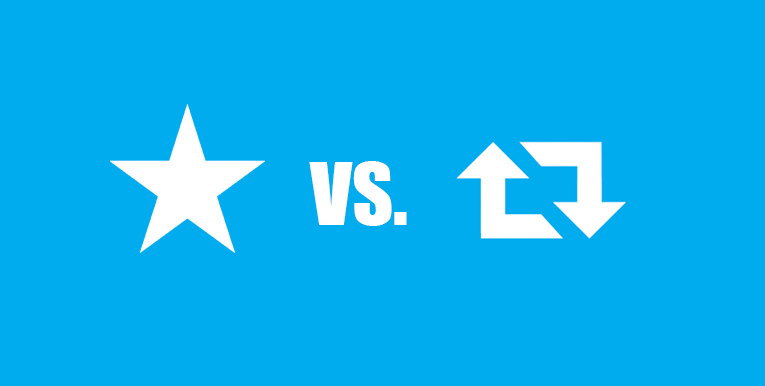 Then Twitter added favourites – a function that ran completely counter to the principles of the retweet. 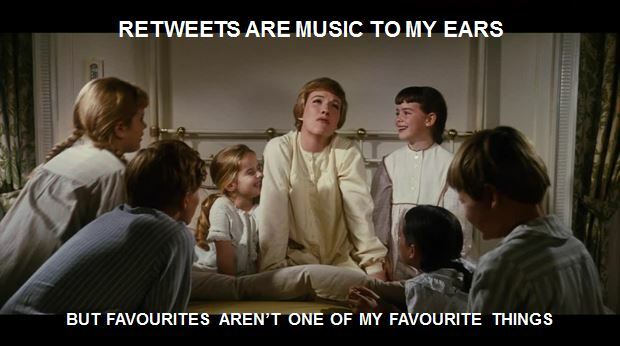 Favourites offer no benefit as a sharing tool as they do not increase the reach of a post. Sure they provide feedback from followers as an endorsement that what you are posting is of value to them, but retweets already fulfil that function well. Furthermore, Twitter announced in late 2014 that it would start showing tweets favourited by people you follow and popular tweets from people you don’t follow, which met with an immediate backlash from the community. This only serves to further clutter the user’s wall and dilute the opportunity to get your message out there. I will say that they function well as a bookmarking tool for those tweets that you want to come back to or investigate further at a later time, particularly with 60% of users accessing Twitter through mobile devices. However, surely this could be implemented in a more effective manner. The key to this is avoiding dead-end content. Favourites are like linking to a page with nothing on it – it doesn’t lead anywhere that will be of any value to anyone. I agree – Favourites serve a useful bookmark function for me, i.e. read later, but if I really endorse something it’s a Retweet. I dislike how people use Favourites to get your attention also. Perhaps something like a ‘Later’ button instead? That would provide a bookmark function without the confusion of it being another meaningless metric. Afraid I don’t quite agree on this one. As you say, one of the post popular uses for favourites is bookmarking – this is one of the key reasons I use them. I may want to read it later, or share the content but through other means – embedding in a website or (if it’s a link) share it on another platform as opposed to on Twitter. Favourites allow me to keep track of content to that end. But perhaps more importantly, if I were to retweet every piece of content I felt deserved ‘endorsement by favourite’ as you put it, my feed would be mostly other peoples content and my voice – and hence, the reason I joined Twitter – would be drowned out, it just doesn’t work like that! Twitter almost seems to be slowly shifting back to what it was like in its infancy, where it was used largely to broadcast. This is quite disappointing, in my view Twitter is at its best when it is conversational and social (after all it is supposed to be ‘social’ media), using it purely to broadcast and amplify content is to fundamentally misunderstand its nature. To use an analogy, if twitter interactions were a real conversation, while retweets could be a verbal ‘yes, I agree’ or a ‘hey, did you hear…’, favourites would be the body language, the nods, the smiles – less explicit yes, but still fundamental to the conversation. Don’t get me wrong, I understand your frustrations as a content creator, but it seems to me a better solution would be to improve the personalised in-app discovery tab, creating something more like newsle’feedly, rather than doing away with favourites. Personally, I both like them and find them extremely useful, and I do hope they’re here to stay. Thanks for the feedback Matt, that’s a very well-reasoned response. Love the body language analogy. I do agree that the bookmarking function is a crucial one, and it is one that I have used. It bridges the gap between Twitter lists and the retweet function. As I say in the article, I most often use the feature when on the go and want to explore something in depth later on. And of course, we wouldn’t want Twitter to become a ream of retweeted content where discussions are killed off. I do, however, feel there is maybe a way to bridge the gap and have a more useful functionality that reflects whether content is liked or simply saved for later. Perhaps a traffic light system – green for likes, amber when saved for later and red when content is disliked or offensive? I think in that case there’s a danger of it being overcomplicated. While yes, that enhanced functionality may be useful for people, like us, using twitter for business, would it be appropriate for all users? I would hazard a guess that the majority of active twitter users are not using twitter for business ends (be that a personal, ‘professional’ or branded account), these users may well be using the button as a ‘true favourite’, if that is the case as I suspect then it is unlikely Twitter would make such a change to benefit a socially vocal minority. What we really need is some research into how the average twitter user utilises the buttons, and if it supports a change like, for instance your traffic light system then great. If not, we may need to look at developing a new, or a variation of a current, dashboard and app service tailored specifically to these needs.